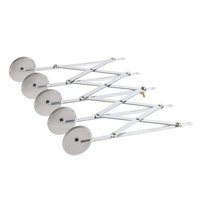 Quickly cut large amounts of pasta and pastry dough with this 6 wheel pastry cutter / dough divider. 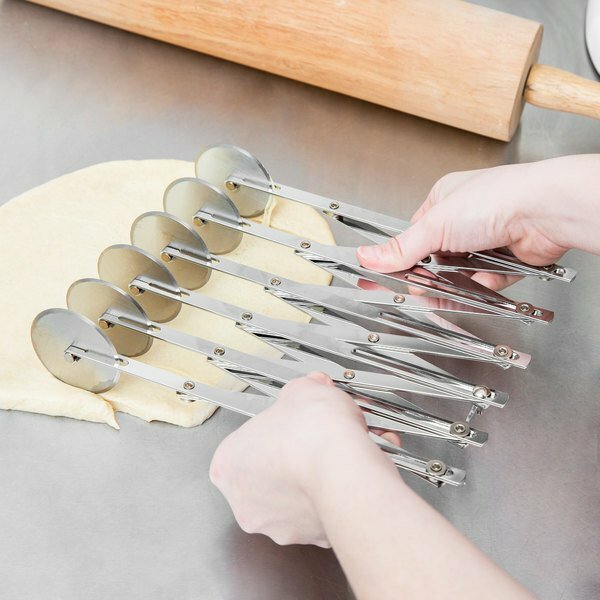 This pastry cutter allows you to easily make quick work out of pasta and pastry dough, producing long strips of dough that can be used to lattice your fresh apple pies, twist spiral breadsticks, or wrap pretzel dogs! Not only does it guarantee fast cuts, but it also ensures that they are precisely cut for a consistent product that helps you effectively control portions and gives your customers the quality product they expect each and every time. "This pastry wheel is a fine product for the home chef who wants to evenly cut or portion baked goods. Whenever I try to eyeball my slices, they come out uneven. But this wheel (which expands and contracts to make different sized cuts) allows me to get precise slices." This cutter is made of stainless steel for long-lasting durability and resistance to rust and corrosion. 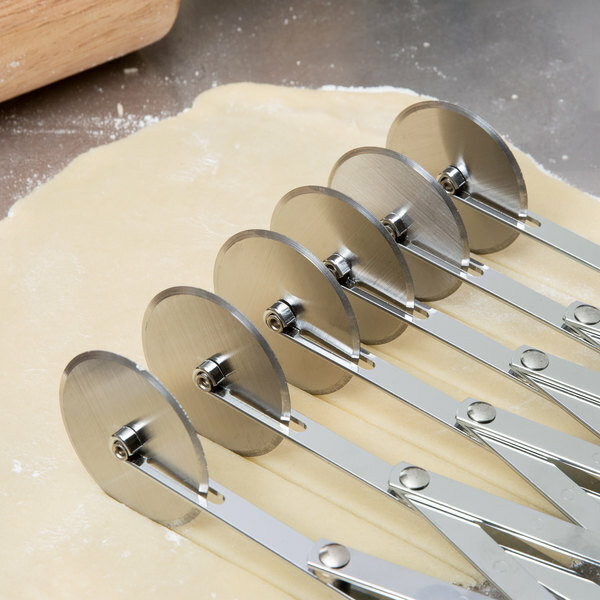 The rugged design gives the 2" wheels the strength to make precise, clean cuts through everything from pasta and pastry dough to fondant! This versatile pastry cutter can be adjusted to make cuts anywhere from 3/4" to 4 3/8" wide - simply expand or contract to the width you'd like and tighten the wingnut so you're ready to cut! And when the tool's not being used, it easily collapses for safe, compact storage. 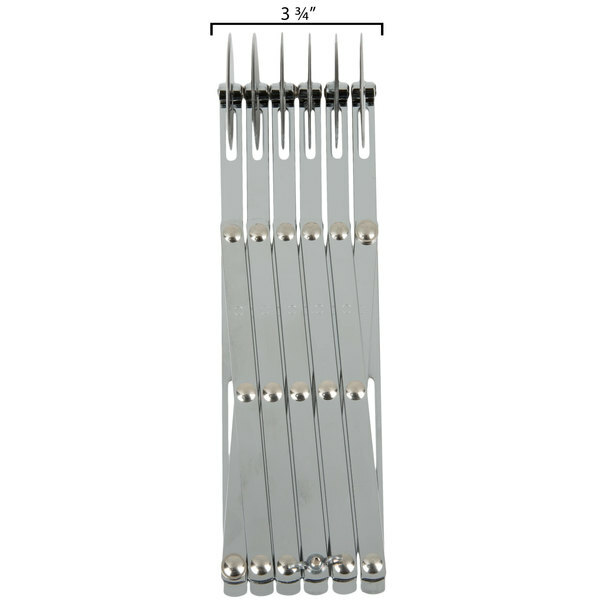 Not only is this item great for cutting large quantities of dough at once, it is also useful for cutting strips of fondant or portioning baked goods, such as brownies, where cutting to a uniform size is imperative. Bought this for my company to mark down my brownies before cutting. Makes my work so much easier, when you have to make around 300 brownies in 2 hours and they all need to be the same size, having a tool like this to mark them saves me a huge amount of time! One of our most useful tools that we don't use for the intended purpose! We use this product for drawing lines across sheet cakes and brownies to ensure pieces are all the same size and portions are equal. This little baby is a lifesaver for someone who struggle to draw a straight line! 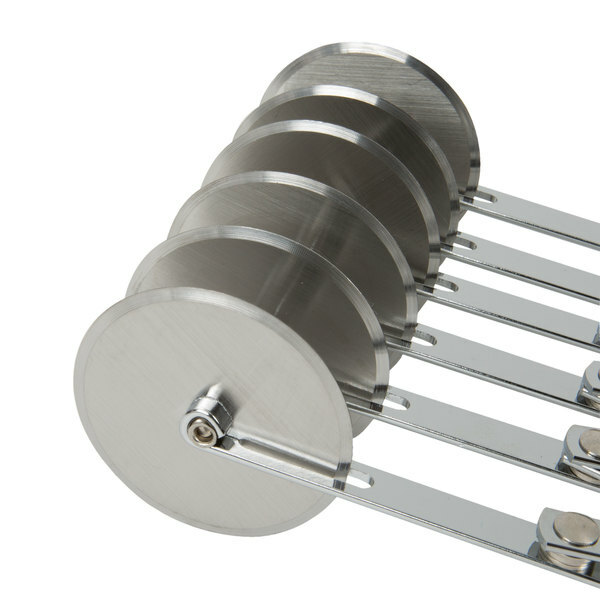 6 wheel stainless steel pastry cutter. This is also a dough divider. It will last awhile if cleaned and taken care of. It was a great addition to the kitchen! Good dough divider. It does not move much once it is tightened so that is a good thing. Works great to cut our chocolate croissants or even our chocolate designs. 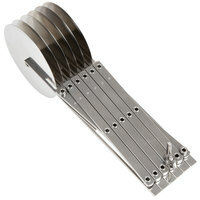 This 6 wheel steel pastry cutter is great for cutting biscuits and other items that you want cut in an exact size. It is similar to a pizza cutter. This cutter is awesome! I use this daily. I like the size and the fact that they are problem free. Adjustable for your needs. I bought 2 and would buy again. 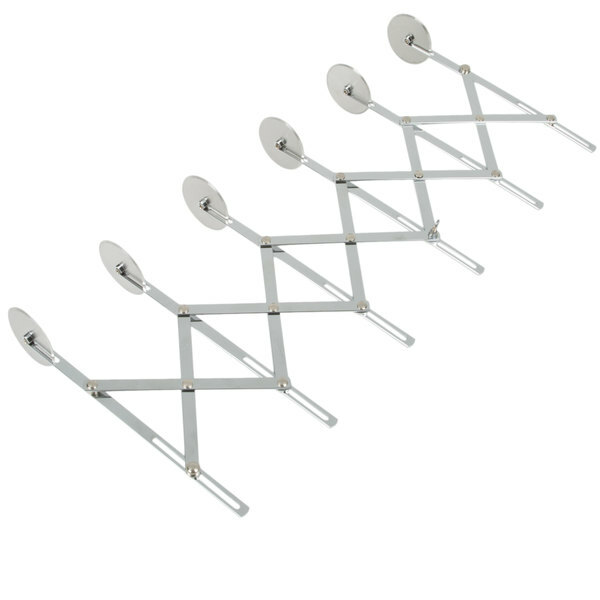 I have been looking for something like this for a long and finally find it at webstaurantstore.com for a very good price. This product work great on fondant and save me so much time when cutting stripes for bows! Wow! What a time shaver! I used to cut 1/2" strips by hand and this little device has saved me so much time! Cuts perfect width strips every time! Very happy with my purchase! Great value pastry cutter for the price. It's really good for cutting fondant strips easily for consistent width and time saving. Haven't tried it on anything other than fondant as yet. This is great for everything from cakes to brownies to cutting uniform strips of fondant. 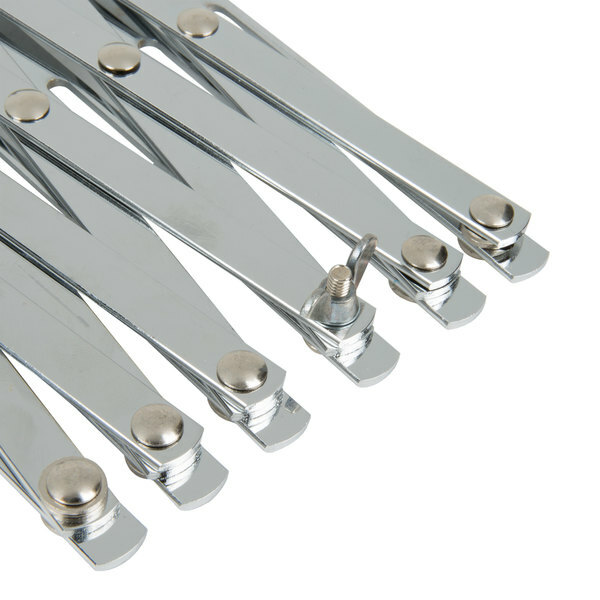 The fly nut tightens quickly and easily to keep your spacing uniform. 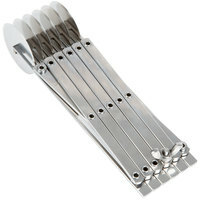 Purchased the 6 wheel stainless steel pastry cutter because of the price and fast shipping. Very nice quality and have had no problems with daily use. The new dough divider / pastry cutter wheel will work in less time making the standard cookie cutter I have now. With this cutter, it will cut my time way down and be more productive. A very Nice piece of equipment, easy to adjust and use. 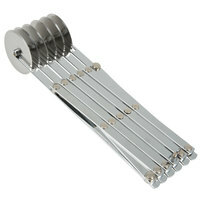 I purchased this to use for myself, it's nice having a quality instrument. I compared this to others like it and decided to get this one for two reasons, 1 the Quality and durability, 2 The price was a far better deal than other places. I have used this cutter several times to cut pasta. I was hesitant in purchasing after reading it can wobble. True, it can, but I have found if you move quickly and do not put massive amounts of pressure on it, it does just fine. I have not tried it with thick pieces of dough, but my primary reason for purchasing was for pasta. Hubby loves using this to cut fudge,brownies and especially toffee. When the toffee starts to harden, it's often a race against the clock. This makes cutting numerous pieces quickly a breeze. We won't be without this, especially since you can vary the sizes to fit your needs. Wish I had gotten sooner. This is great for cutting the perfect size brownies, croissants, and bars. I love this tool because it saves so much time and makes all of my product a consistent size. This product cuts my various products to the size I need without tearing or missing spots. This product guarantees its equal sizes every single time.